Το ακίνητο βρίσκεται στην πιο πανέμορφη τοποθεσία του νησιού της Σαντορίνης, στο χωριό της Pyrogs τοποθετείται ακριβώς στη μέση της ρύθμισης αρκετά αποκλειστική καλντέρα. Όμορφη βεράντα του ξενοδοχείου προσφέρει μια αδιάκοπη ειδυλλιακή θέα όλου του κόλπου καλντέρα, ηφαίστειο και το Αιγαίο Πέλαγος, καθώς και τα κοντινά νησιά. Το σπίτι είναι χτισμένο στο βράχο του λόφου, σύμφωνα με την παράδοση του νησιού. Το εσωτερικό και το εξωτερικό του ολόκληρο το ακίνητο ανακαινίστηκε το 2014 από το έδαφος επάνω από έμπειρο αρχιτέκτονα προσφέροντας ένα απαράμιλλο συνδυασμό της καθαρής κυκλαδίτικη παράδοση και όλες τις σύγχρονες ανέσεις. Αυτό το σπίτι παρέχει όλες τις απαραίτητες εγκαταστάσεις σας κάνουν να νιώσετε σαν στο σπίτι σας. Πύργος Terrace House είναι ένα μίγμα λειτουργικότητας και απόλυτη άνεση με 2 μινιμαλιστική μπάνια, 2 άνετα υπνοδωμάτια, ένα πλήρους μεγέθους κουζίνα, ένα ευρύχωρο κατάσταση της τέχνης σαλόνι, βεστιάριο, Ac και στα δύο υπνοδωμάτια, τηλεόραση, CD-DVD player WiFi και θα σας δώσει μια ακόμα πιο ευχάριστη και άνετη διαμονή. Κάθε δωμάτιο του σπιτιού αποτελείται με την τελευταία τεχνολογία σύστημα θέρμανσης δαπέδου για το χειμώνα τη διαμονή σας. Τελευταίο αλλά όχι ασήμαντο είναι ένα υπέροχο τζακούζι με υπέροχη θέα στον κόλπο της καλντέρας. Πύργος Terrace House προσφέρει την αυθεντική εμπειρία στα ελληνικά νησιά, είτε είστε στην κουζίνα ή σε ένα ή τον άλλο υπνοδωμάτιο έχετε την καλύτερη θέα στην καλντέρα. Η οποία δίνει στη βίλα ένα μοναδικό προνόμιο. Top of the world views, and wonderful accommodations. The location is amazing. The manager is a delight. The view and the features of the apartment are magical. We enjoyed our stay so very much. Restaurants at your fingertips, and so much to see. We will be back. Amazing apartment in a beautiful location!! The apartment is as beautiful as the pictures! Location is perfect and the furnishings are first rate! Wonderful sites, restaurants and an amazing bakery are all close by! Anastasia is so helpful arranging drivers and offering suggestions!! Only downside might be the location of a bigger grocery store. A beautiful, quiet town. Definitely hope to go back!! Five close friends and I rented this property in June 2018 and has an amazing time! The property is located in a more quite town of Pyrgos (south of Thira). Originally we had no idea where that was and just booked the property because of the hot tub. I was glad we did because Pyrgos is more quite and quaint of a town than Thira. The property is decorated professionally with a mix of old and new. Very spacious, well lit with lots of natural light and has a hot tub and rooftop with great views. I cannot rave enough about our host Anastasia. She was amenable, very communicative and patient. Messages were returned almost instantly and she was very helpful. Anastasia arranged ground transport to and from the sea port and airport for us. She also helped us book a sailing experience. The sailing was the highlight of my Greece trip and I thank Anastasia for that. She also helped us by recommending several great restaurants that locals eat at. Her recommendations were spot on and memorable. I would highly recommend this property to anyone looking for an authentic Santorini experience that immerses you into the culture of the island. Our stay was fabulous! Beautifully decorated, comfortably equipped, with amazing views of the whole island, sunsets and located in Pyrgos , away from the crazy tourist crowd. Halfway up the donkey lane hill amidst picturesque white rock houses and small shops. Pinch me as I felt like we had stepped into a picture postcard of how you dream Greece to be. I already wish I could go back! Anastasia was a dream hostess and helped us with everything including an emergency call to the hospital when my husband fell and split open his knees the first night there. She was our guardian angel and helped us enjoy everything about Santorini despite the accident. Hospital and doctors were wonderful. On a scale that of 5 our stay here was a 10. We stayed for just over a week at Pyrgos terrace House at the beginning of October. We (four adults) were extremely comfortable. The house is very well equipped and any problems were resolved immediately. 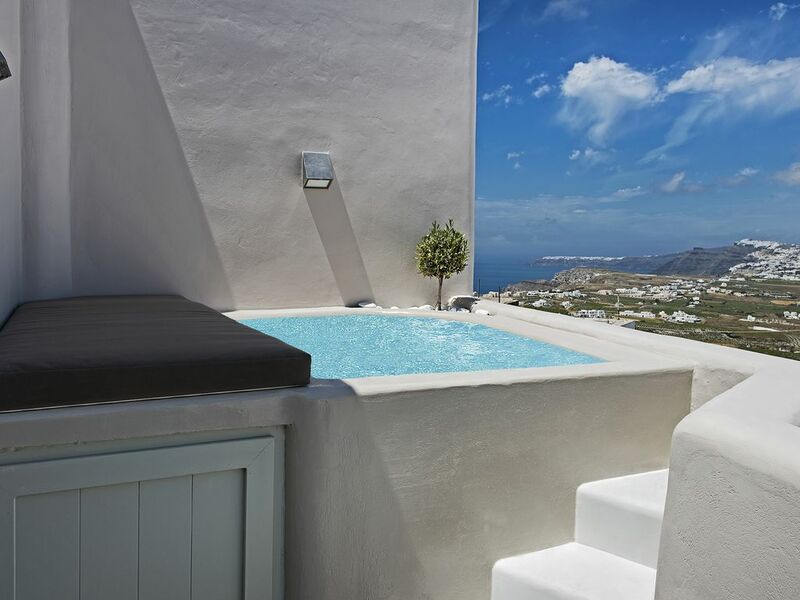 We enjoyed the hot tub and the spectacular views from the roof terrace to the caldera and of more or less the whole of the island of Santorini. We also enjoyed being in the village of Pyrgos, which is the former capital of Santorini and much more traditional than many of the other villages. The people there were very friendly and helpful. We used the local bus from the village square to go into Thira and across to Perissa and hired a car from the village for 3 days to visit Oia, Akrotiri and many of the other villages. We also enjoyed a sunset trip around the caldera with Barbarossa. Pyrgos Terrace House was the best! Great location high up in the hills overlooking the Caldera without all the crowds and tourists in Fira and Oia. We were able to experience the local neighborhood action, including the donkeys walking up and down the hill, from behind the privacy of the walls of the house. The house is beautifully appointed, and very clean and comfortable with all modern amenities. Beautiful bathrooms. Awesome rooftop terrace with spectacular views! The plunge pool was a great way to relax in the evening. Anastasia, the villa manager, was wonderful!! She generously arranged for several excursions to wineries, and for a sail around the Caldera. She also recommended some wonderful restaurants and arranged for dinner reservations.....including a special wedding anniversary celebration. When we arrived back at the house from dinner, we found a bottle of wine chilling, along with lit candles everywhere. It was an anniversary we will never forget! The house is a very short walk from wonderful cafes and restaurants, yet it feels very private. Staying in Pyrgos and at the Pyrgos Terrace House was the best decision we could have made! Wish we could have met Haris, who was extremely responsive answering questions we had before we arrived in Santorini. We would highly recommend Pyrgos Terrace House, and hope to return!